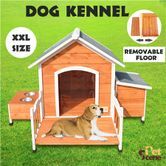 Give your dog a place of his own with this XXL Luxury Wooden Dog House with Removable Porch and Floor! Elegantly constructed with high quality natural fir wood and featuring a removable plastic door and floor to allow for maximum air circulation creating a natural fan to help keep your pet cool. The sloped roof ensures your pet remains clean and dry as rain and snow slide off and the asphalt texture keeps it from leaking. 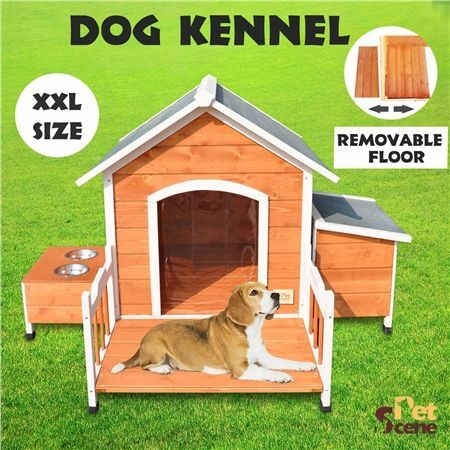 Equipped with a personal outdoor shed for storing toys and an outdoor food and water bowl this pet house this lavish pet house is for any dog. This comfortable spacious dog house provides shelter from the elements and a sense of safety for your dog! Poor quality. This item is not XXL. Although measurements were correct.